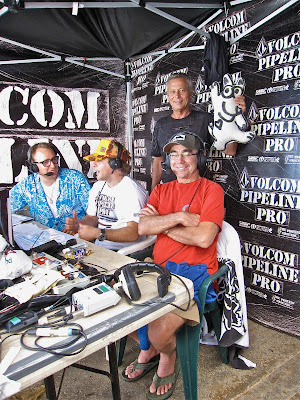 This is the media tent at the Volcom Pipeline Pro. Herbie Fletcher is holding me and Jerry Lopez, Mr. Pipeline, is in the red t-shirt. 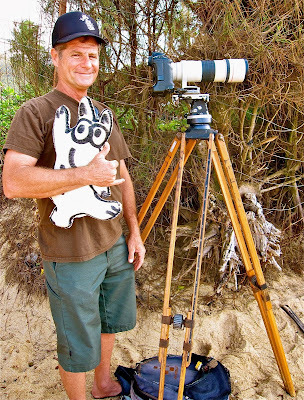 Jerry started one of the first surf companies in Hawaii, Lightning Bolt, and is famous for his "tube" rides at Pipe. Richard Woolcot, the owner of Volcom, is next to him and Chris Cote is in the blue and white aloha shirt. The contest was streaming live around the world and these gentlemen were giving a blow by blow account of what was happening on the waves. Koa spent the day cruising at the Pipeline Pro. What a lucky dog. What a life! I'm ready to join him-----what a minute, I have that life too! Makua just rode in from his heat at the Pipeline Pro. He did well! That's Anthony Walsh (Walshy) from Australia sitting on his board. He had competed earlier and is moving on to the next round. 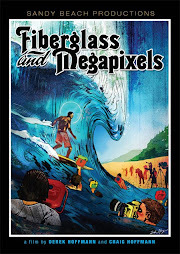 Chris Hagen, staff photographer for Future Fins, was taking in all the action at the world's most famous wave----the Banzai Pipeline. This contest has two more days to run so check it out on the live stream. 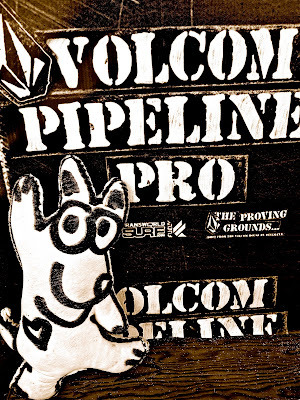 Go to volcom.com and tune in. In Hawaii it will be on Oceanic Cable Channel 250 and1250 (HD). I'm in the herb garden of Kapiolani Community College. The students in the Culinary Arts Deparment use mint, basil, chives, marjoram, and parsley to enhance the food they prepare. Shhhh---this is almost a secret----lunch and dinner are served in the fine dining room for a very reasonable price and I mean, very reasonable. Call ahead and make reservations at 734-9499. It's a must! One of my favorite artists and friends, Bernie Moriaz, was hanging his art in the KCC dining room when I was on campus. I had been talking to the Culinary Institute operations manager, Jerome, asking him about the herb garden. 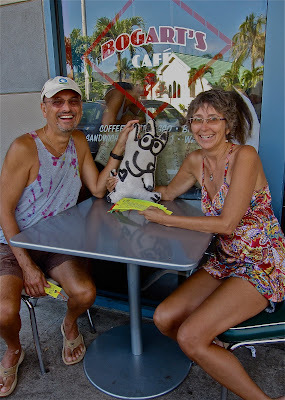 I was telling him how I was a very "green" dog and he mentioned that a recycled artist was putting up his work inside. I was invited up and "bingo", there was Bernie. I spent about an hour chatting and taking pictures of his work. He's showing with another artist, Mark Jacobson. This is one of Bernie's recycled mermaids. 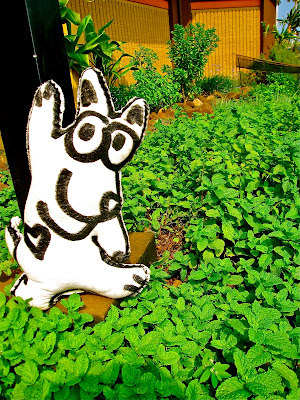 He does lots of metal sculptures and they are usually bright and colorful and full of whimsy! 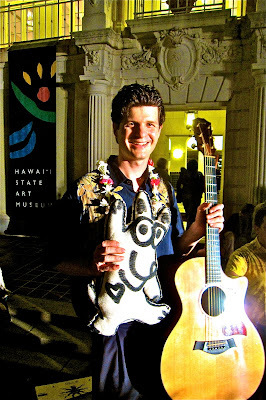 On occasion he's at the Haleiwa Farmers' Market on Sundays from 9 to 1. That's where I am every Sunday! I was lucky when I was at Kapiolani Community College. I met Professor David Behlke who is the Director and Curator of the Koa Art Gallery and he took me for a tour. These two "relief" prints were my favorites. They are by Kimberly Chai. The art showcased the work of faculty members at the school. 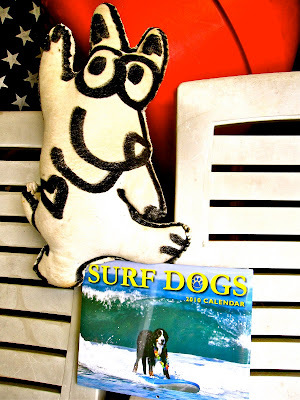 Drop in sometime and enrich your life and, maybe, get inspired! Brenda was at the Arts Festival at Kaipolani Park showing off her husband, John's, work. Those figures are replicas of petroglyphs or "ki'i pohaku" which are stone carvings by ancient Hawaiians. Did you spot the surfer? Look hard. I really liked the colors and images Kimo was using! 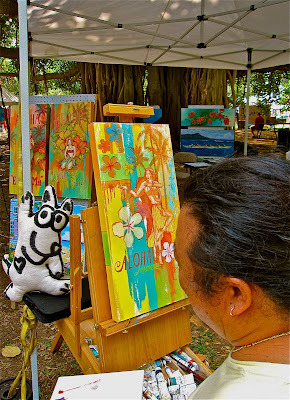 He was painting under a gigantic banyan tree across from the beach in Waikiki at the Arts Festival. What a wonderful way to while away the day! 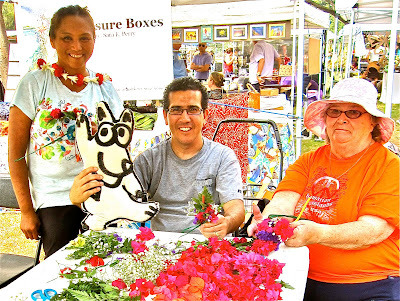 Lena, on the left, was teaching Tom and Betty from San Diego to make "haku leis" or "head leis". Lena was making sure the visitors to her tent understood conservation. She emphasized using "just what you need" and making sure to leave flowers and ferns behind for others. 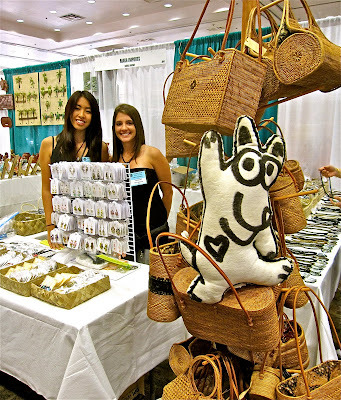 Donna, on the left, and Kimberly were at the Arts Festival at Kapiolani Park, too. They were making me laugh and laugh! 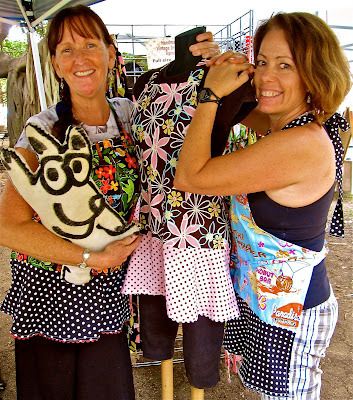 Donna sews those fabulous aprons and Kimberly has a line of frames and switchplate covers. I love them. Linda Robb (Kalani's mom) makes beautiful Hawaiian coasters, mousepads, and glass cutting boards. 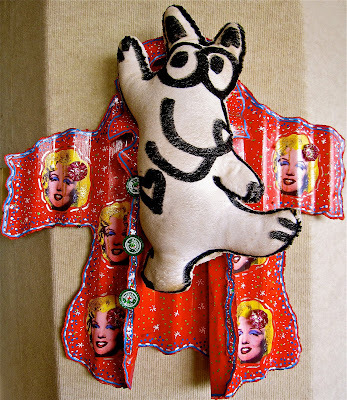 She uses local artists' work, the most famous one being Peggy Chun. You will love what you see! I promise. Hokulani was dressed to the nines for the Arts Festival at Kapiolani Park. What a Pomeranian! This five-year-old has a whole dresser full of costumes at home! The sunglasses are to protect her eyes from the bright, tropical sun in Hawaii. Maybe it's time for me to start dressing up. What do you think? I'm leaning towards some kind of straw hat. Do you think it will become me? Molly joined me at the Optimysstic Festival in Haleiwa at the Waialua Community Association across from the Post Office. I was there sharing seeds and making new friends. What do you think of those red-stained barefeet? No boots for her, no gloves or muffler either. Lucky you live Hawaii, Molly. I'm sitting on a very small backhoe seeing what Lee Byrant, in the orange t-shirt, is doing. 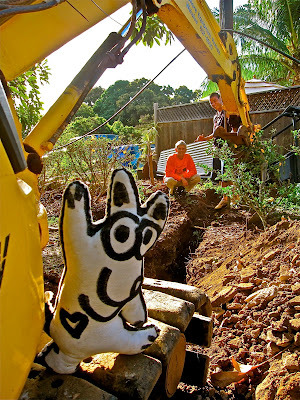 Well, he and Gary were digging a trench for the electrical wires to the North Shore Chamber of Commerce office. These volunteers are making this old building ready to use and that's good for the whole community. Lee owns North Shore Equipment Rental and does lots of pro bono (free) work for this neighborhood. Gary thought he'd show me how to nail down tar paper. 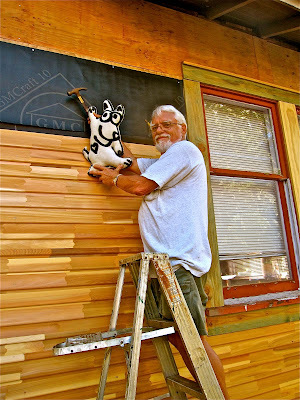 He was putting up this "vapor barrier" before the cedar shiplap siding was nailed on. Gary is just one of the many volunteers who give his effort and time to get the Chamber Office up and running. To learn more go to: GoNorthShore.org You could volunteer, too, or buy a brick for the wide entryway sidewalk. Carter Allen is in his health food store, Celestial, between his two daughers, Lei, on the left, and Melody. (Peek-a-boo, do you see me peering out of the market bag? Carter opened this store in Haleiwa 36 years ago to the day!! He was having a big "Everything in the Store 20% Off Sale". I like that kind of sale! Sam and Gwen of Kettle Corn Hawaii were stirring up a kettle of popped corn. It was still warm in the bag when I bought mine at the concert. It was yummy - lots of fiber and very tasty. Read one of my favorite books called POPCORN by Frank Asch. This is a very, very fancy boat called a "Yacht". It's been cruising around the Hawaiian Islands for the last month or so. 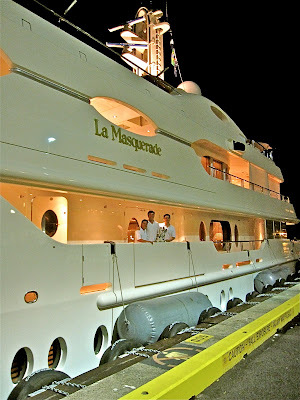 La Masquerade was docked at the Aloha Tower . The owner, Sir Robert Ogden, from England, is on a three year ocean jaunt. He's famous because he's rich and, also, he helps teenagers in England go to college or trade school - he pays for it. The three crewmembers on the deck with me are, from left to right, Emir, Ross, and Leo. They were having a fine time on this boat and loved talking to me telling me all about it! Some people believe in making wishes at the beginning of each new year. 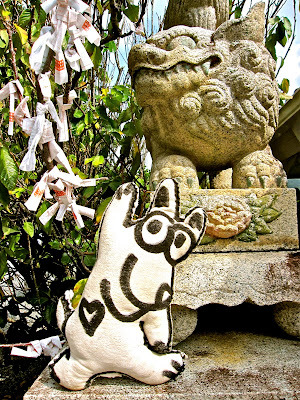 Those are fortunes tied to a tree outside of a Japanese Shinto temple. The people who come here buy a wish and if they don't like the wish, they tie it to the tree and go buy another one. It only cost a quarter. Learning that is what makes living in Hawaii so special. There are so many different cultures represented here and each one comes with its own ways. Look at that white orb and you'll see a "Blue Moon". What's a blue moon? It's the second full moon during the same month. I was heading south to Honolulu from the North Shore on New Year's Eve and this was my view. 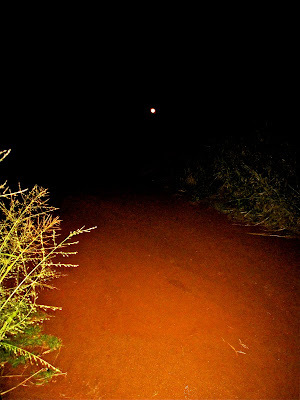 That red dirt is a sugar cane road which is mostly volcanic soil that has lots of iron in it. It's New's Year's Day and I was invited to a picnic/party in the middle of the island. Wow, can you believe this is the kitchen window sill of a cabin. Now, remember, it's January 1st. Lucky I live Hawaii! 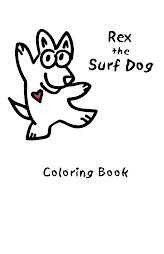 One of my favorite canine friends is this one. He's a Swedish farm dog called a "Vullhund." His name is "Hoku" which means "Star" in Hawaiian. We got to know each other sitting near the campfire in the middle of the day at our New Year's Picnic! I spent Saturday morning on the campus of the University of Hawaii. I was a guest, can you imagine, me, a guest, of disc jockey, DJane. I had so much fun. I laughed a lot. 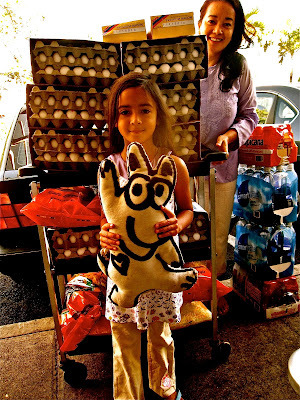 DJane was subbing for DJ Native while she visited her family on the Big Island. DJane's regular show is on Friday mornings from 9 am to noon. Listen in, it's live streaming at www.ktuh.org The soulful tunes on her Friday show are mostly for your parents, but when we are together, the music is for children of all ages! DJane and I laughed a lot! She was so funny and I really like her curiousity. We had a great exchange from 6 to 9 am. I was up very, very early to get there on time. Watch for bulletins on my blog for the next time I'll be spinning discs with DJane on KTUH. Kevan came in after DJane's show for his three-hour stint. He has be a disc jockey at KTUH for 34 years! Now, that's quite a long, long time. How many months would that be? Hummmmm..12 times 30, then 12 times 4. Then add.